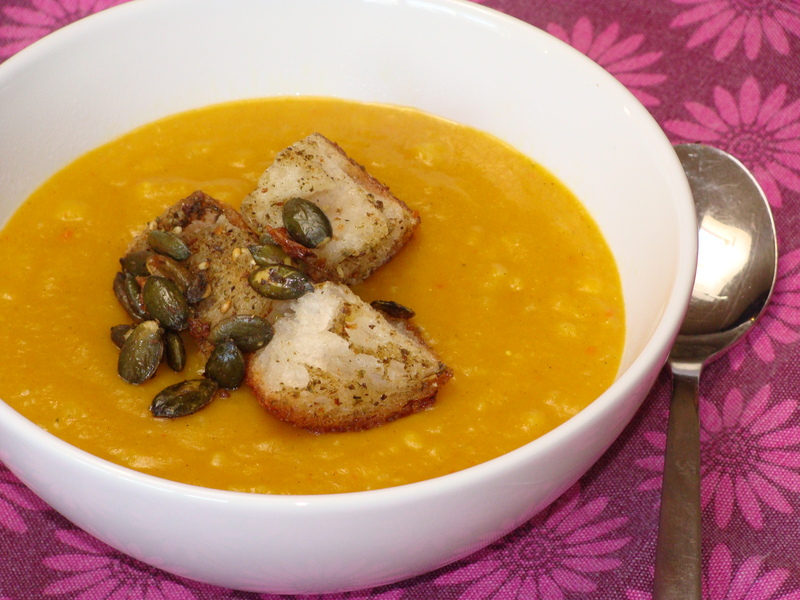 From Sally Butcher’s fabulous guide to Middle Eastern meat free cooking – Veggiestan – this soup is a delight. Perfect for keeping those January frosts at bay. This makes enough soup to feed four or five. Heat oil in a large pan then add the onion and fry until soft (about 5 minutes) then add the garlic, chili and spices, fry for a further 2 minutes then add the pumpkin or butternut. Add the stock and bring to the boil. When boiing add half the rice, cover and reduce heat. Simmer for half an hour. While the soup is simmering, cook the rest of the rice in boiling water for 15 minutes. Drain and set to one side. When the soup is done and the pumpkin cooked through, remove from the heat and blend. Add the drained rice and return to the heat to keep warm. Take a large frying pan, add some more oil then fry the diced stale bread. When the bread starts to colour add the pumpkin seeds and za’atar. Fry for a further minute or two stirring all the time. Serve the soup with hot croutons.